Intake forms are provided below to bring to your initial visit. If you would prefer we provide them to you in person, please arrive at least 15 minutes before your scheduled appointment. The form below can be used by any practitioner wishing to refer to Dr. Jennifer Pyatt or Dr. Matthew Pyatt for naturopathic medicine. A referral is not necessary but is appreciated. The form below can be used by your current naturopathic or medical doctor to refer to Dr. Matthew Pyatt and/or Dr. Ryan Best for naturopathic oncology and/or hyperthermia treatments. A referral is not necessary but is appreciated. 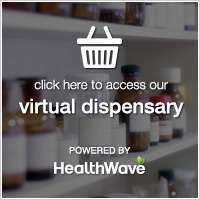 This virtual dispensary allows us to prescribe our patients professional health products online and have them shipped to you within 3-5 days. This option provides a greater inventory of products to choose from and allows patients to refill without having to come into the office. Access to this online service is available once you are a patient of the clinic and receive an emailed prescription.